Epiphytes (plants that grow on other plants without parasitizing them) are not restricted to the rainforest. 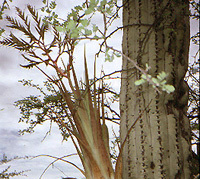 This tank bromeliad in the genus Tillandsia (Bromeliaceae) is growing on the trunk of a cactus, Cephalocereus tetetzo (Cactaceae) in southern Puebla. The Bromeliaceae and the Cactaceae are the two largest families that are restricted to the New World.